Switching from a closed development process to open source: making the code available as GPL and the art content available as CC-BY-SA, and encouraging external contributions. We've been working on 0 A.D. in our free time for years, and now we want to show what we've achieved and make it easier for more people to get involved. See the Getting Started guide to find more information about the game, forums for discussion, instructions for building and running the game, and links to further details. For the full announcement, see the dedicated page for explaining why they moved to open source from the closed development model. 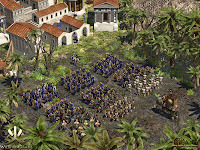 For more media and information on the game, go to the official 0 A.D. website. This is, of course, an exciting development. This game has been in production of some form for nearly 8 years, has 150k lines of code in the engine, and hundreds of dedicated (and now shared) models. It will be very interesting to gauge the impact this has on the open source game community. The game itself is not yet complete but it's definitely more than a tech demo, so it will also be interesting to see if the move to open source galvanises the project and gives it the push that it needs to get to a more complete/playable state. Andrew: The build instructions page already has a .tar.gz, which shouldn't break when downloading (I hope!) - are there problems with that that make the torrent a better option? Andrew: The build instructions page already has a .tar.gz, which should download without breaking (I hope!) - are there problems with that that make the torrent worthwhile? Looking Nice..How can I get it,Is it compatible with windows XP & I want to know the system requirements for running this game. Are there pre-compiled builds? I can't seem to find them.